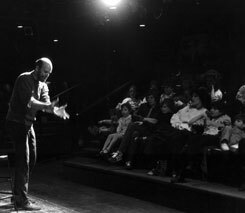 My family programs are designed to entertain, enlighten, and delight my entire audience... not just the kids in the crowd. As a parent myself, I attended dozens of family programs. And I learned that the adults, too, deserve to have a good time. I perform in the "troubadour" style, a mode that harkens back to a time when wandering minstrels traversed the European continent, providing music, stories, and a dose of philosophy to excited village gatherings in return for bed and board and a few coins for their talents. I have successfully performed both indoors and outdoors at a variety of venues, including school and church events, campfires, family get-togethers, libraries, outdoor festivals, birthdays, and holiday celebrations. Although you needn't feed or house me, you can expect a highly participatory event that includes stories and songs guaranteed to amuse, satisfy, and include everyone, from toddlers to seniors. The style is irresistibly contagious! Jay is a treasure in our children’s lives and in Rochester! The performances are absolutely unforgettable!